If you were one of the many, many sad people who missed out on snagging the NES Classic Edition before Nintendo inexplicably pulled the plug on it, there’s still a chance you can get one without spending hundreds on eBay as ThinkGeek has apparently stumbled onto a massive cache of the consoles. Update, 3:47 p.m. EST/EDT: Looks like they’re already completely sold out. Is there a catch? Of course there is. ThinkGeek claims to have thousands of units in stock, courtesy of its parent company GameStop. 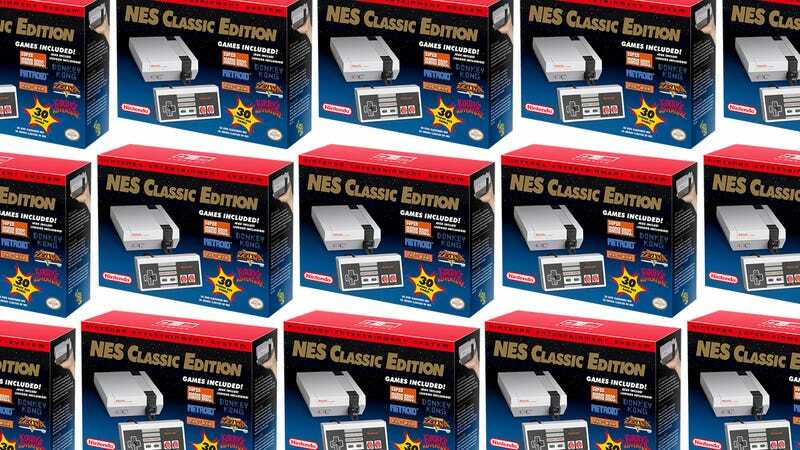 They’re available for purchase as of 3pm EST today, but while ThinkGeek won’t be selling its NES Classic Editions with as steep a markup as most eBay sellers do, you’ll still only be able to buy the sought after console as part of a bundle with other Nintendo merchandise. ThinkGeek’s NES Classic Edition bundles are still cheaper than getting one off eBay. The cheapest bundle, which includes box art, a Legend of Zelda puzzle, and a Piranha plant puppet, pushes the console’s price tag to $140, more than twice what the NES Classic Edition originally cost. Other bundles include collectibles like Zelda shield backpacks and stackable Tetris lamps, but the most expensive option will cost $220 and come with a Mega Man wearable helmet and Proto Man Buster blaster replica. Can you guess which bundle will sell out the fastest? Where exactly did these unsold units of an unbelievably coveted gadget come from? ThinkGeek and GameStop won’t say. There’s an element of shameless cash grab going on here, but at least the mini consoles will make their way to the hands of fans sitting at their computers right now. Nintendo has promised to ramp up production for its forthcoming SNES Classic Edition, which brings with it a never-before-released sequel to Star Fox. But Nintendo has a notorious history of releasing hardware with a limited supply to bolster demand (remember the eternal lineups for the Wii?) so you might still have a hard time getting the SNES Classic Edition on launch day in September. But with enough patience hopefully you’ll be able to find one before the holidays make it impossible again. Why Did Nintendo Just Kill One of Its Coolest Products in Years?